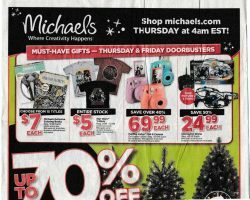 View Michaels Black Friday 2015 ad. Save with this year Michaels Black Friday deals on coloring books, holiday decoration, handcrafted floral arrangements, tabletop frames, candles, decorative boxes, holiday roll wraps, ornament frames, artist paper pads, all media art sets and jelly watches. 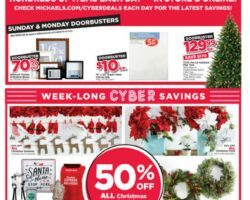 Michaels Black Friday Deals 2019. 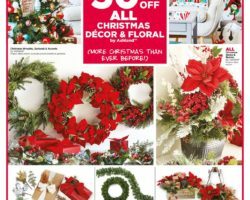 Find Michaels Black Friday ad, deals and sales for 2019 from blacknfriday.com. 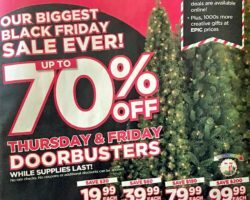 Don’t miss this year hottest Black Friday Deals & Pre Black Friday sales & coupons. Michaels is an arts and crafts retail chain in America that, in addition to art supplies, it also sells custom frames, offering a broad range of personalization framing options. Moreover, the retailer also features online and in-store classes for customers all ages who want to learn how to work with paints, how to knit, how to sew and how to perform various other activities. The retailer featured departments are baking & party, crafts & hobbies, papercraft, sewing & fabric, wedding, canvas, and beads & jewelry, each department encompassing various product categories. The retailer features many sale and clearance events on a regular basis. 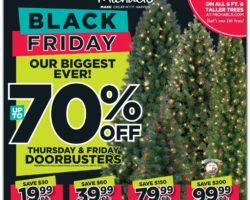 In addition to everyday savings, the retailer also has special deals during the Black Friday time of year when it usually offers big savings in every department. 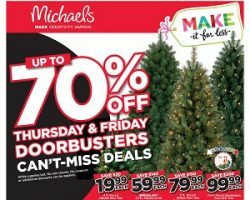 The last year Michaels Black Friday Sale Ad included up to 70% off on anything from Michaels Exclusive Coloring Books to Christmas decorations and paper crafting. Deals rolled out for two days starting Thursday 4am online and continued in stores until Saturday.